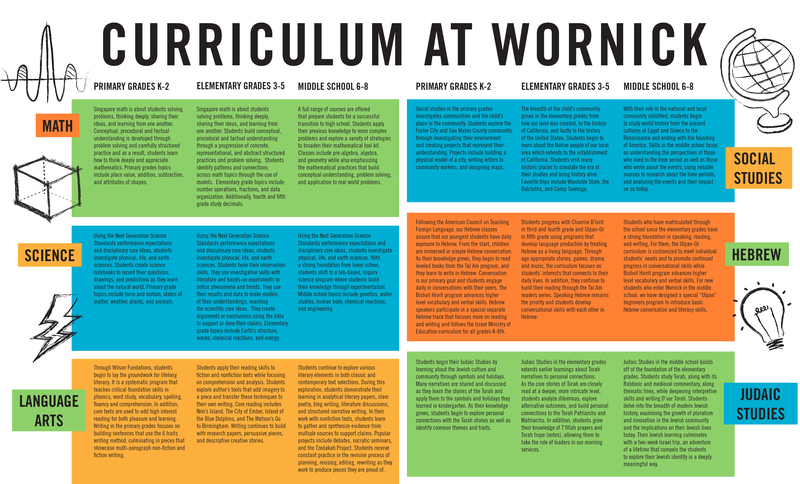 Science, Technology, Engineering, Art and Math are core components of Wornick’s interdisciplinary project-based curriculum, which emphasizes conceptual understanding, critical thinking, hands-on activities, and real world learning. 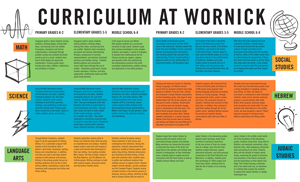 Wornick’s Science curriculum follows the Next Generation Science Standards (NGSS). In TK-2, students study physical, life, and earth sciences, using science journals to record their observations and predictions on topics such as force and motion, states of matter, weather, plants, and animals. In Grades 3-5, students continue to work on their observation and investigative skills, conduct experiments, and use data to model their understandings. Areas of study include the Earth’s structure, waves, chemical reactions, and energy. In Middle School, students experience a lab-based, inquiry science program where they build knowledge through experimentation. Topics in Middle School include water studies, geology, genetics, cell biology, chemical reactions, and Newton’s Law of Motion. Fifth through eighth graders participate in the annual Science Fair, which requires long-term planning and project management to meet deadlines. Students formulate testable questions, perform research, make and test their predictions, and present their projects to Wornick’s judges. Winners of the Science Fair can proceed on to the county level competition. Technology is integrated throughout the day in the classroom, as well as in the Peleh Lab (“Wonder” in Hebrew), Wornick’s Makerspace. Skills include typing, user interface, presentation, communication, arts production, programming and coding, digital citizenship, and integrated design thinking with topical projects. Students have access to ipads, chromebooks, laptops, 3-D printer, cricut machine, robots, VR technology, as well as traditional tools appropriate for their learning project. Middle Schoolers have a one-to-one laptop program. There are many opportunities for creative expression through Art and Music. Art in the lower grades emphasizes art appreciation and technique through weekly work with an art specialist, as well integration with other subjects. Music, singing, and performance art at Wornick are integrated into the TK-8 General Studies curriculum, as well as in the Judaic Studies and Hebrew curriculum. In 2018-19, Wornick piloted a new Musical Theatre program in First-Fifth Grade. Fourth and Fifth graders study percussion. All Math at Wornick is based on the Common Core Math Standards. Singapore Math is the Math program used in the lower grades. It empowers students to understand math concepts, procedures, and facts through problem solving and structured practice. In TK-5, topics include place value, addition, subtraction, and shape attributes. In Grades 3-5, students study number operations, fractions, data organization, and decimals. Middle School Math courses include pre-algebra, algebra, and geometry. Students experience more math fun at our TK-5 Math and Peleh Lab Expo Night. Our Middle Schoolers can participate in Math Club, which meets weekly. Members of the Math Club may also attend Math and Science Day at Great America and participate in a variety of challenges that use math and science knowledge to complete. Middle School STEAM electives may include Peleh Lab, Coding, Engineering, 3D Printing, Robotics, Strategic Thinking Through Board Games, Cooking, Art, Drama, Musical Theatre, Yearbook, and Making Change Through Art. Check out all the fun projects that take place in Wornick's Peleh Lab! Music courtesy of freemusicarchive.org.